Miriam Goldberger, founder & co-owner of Wildflower Farm has written a book! Order your copy today! Taming Wildflowers .. This fragrant wildflower is known for its feathery, fern-like foliage and flattened flower clusters. 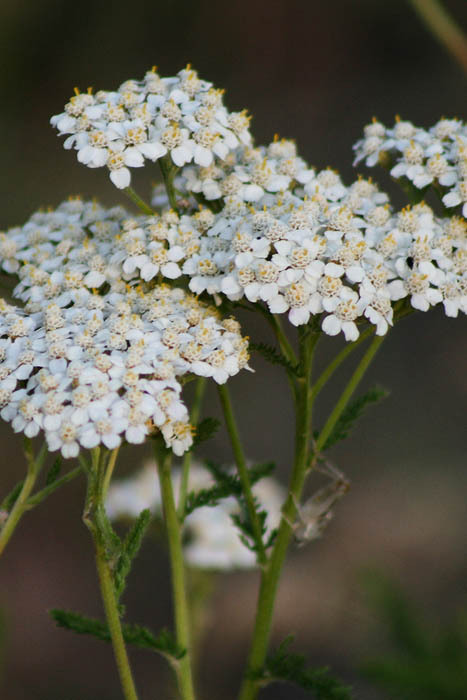 Achillea millefolium is easy to grow from seed, deer resistant and very drought-tolerant once established. Note: White Yarrow spreads via rhizomes so give it plenty of room! All Wildflower Farm seeds are hardy through growing zone 3, organic and non-GMO. Indoors: No pre-treatment necessary other than cold, dry storage. Start at least 4 weeks before outdoor night temperatures are reliably in the 10 C (50 F) range. Plant seed 3 mm (1/8 inch) deep in pots. Keep moist but not soggy and very warm (21 C - 70 F). When seedlings are 5 cm (2 in.) tall, transplant into the garden spaced 30 cm (1 ft.) apart. Outdoors: Sow seed 3 mm (1/8 inch) deep outdoors in either late fall or early spring. Outdoors Alternative: In late fall through to mid-winter fill plastic pots with a slightly moistened, sterile, soil-less growing mix. Sow seed 3 mm (1/8 inch) deep in the growing mix and label the pots. Place the pots outdoors in an area where they will experience the snow and cold of winter. The seed will germinate in the pots in spring as the weather warms up. Be sure to water the pots regularly in spring and once the plants are 5 cm (2 inches) tall, transplant them into your garden.